Archibald Cochrane died in 1958, long before I was born, yet I grew up with one foot in his world, even if it was a world in decline and adrift in the past. My childhood’s London house was full of treasures acquired from his time in Burma – traditional hill tribe costumes carefully folded into battered trunks, beautiful gold leaf lacquer bowls, watercolours, the banner that flew over Government House in Rangoon. During a harsh winter when our antiquated heating system broke down, I padded about the house in a heavy overcoat, only later finding out it was my grandfather’s navy coat. His shadow looms from a world where the values of empire and monarchy were more prevalent yet collided with the catastrophes of the two world wars. His shadow looms in the way he was a father, and the way his son was father to me. He was born in January 1885 and in 1901 entered the navy, a family tradition. During World War One he was mentioned in despatches three times and was awarded the Distinguished Service Order and Bar. As commander of submarine E7, he served in the Sea of Marmara where he inflicted damage to enemy shipping and shelled a troop train. In September 1915, E7 was damaged and trapped in nets, forcing the crew to scuttle the submarine and surrender to the Turks. My grandfather spent the next two years in a prisoner of war camp. In 1918 he and a group of officers escaped from the Yozgad Camp and trekked on a long and dangerous journey to the coast where they captured a boat and sailed to Cyprus and freedom. The account of the escape was published by two of the officers in a book titled 450 Miles to Freedom. In 1921 he retired from the navy and sailed a fishing boat from Scotland top the Mediterranean to engage in commercial fishing for a year. He returned to Britain, married my grandmother, Julia Dorothy Cornwallis, and started a political career. 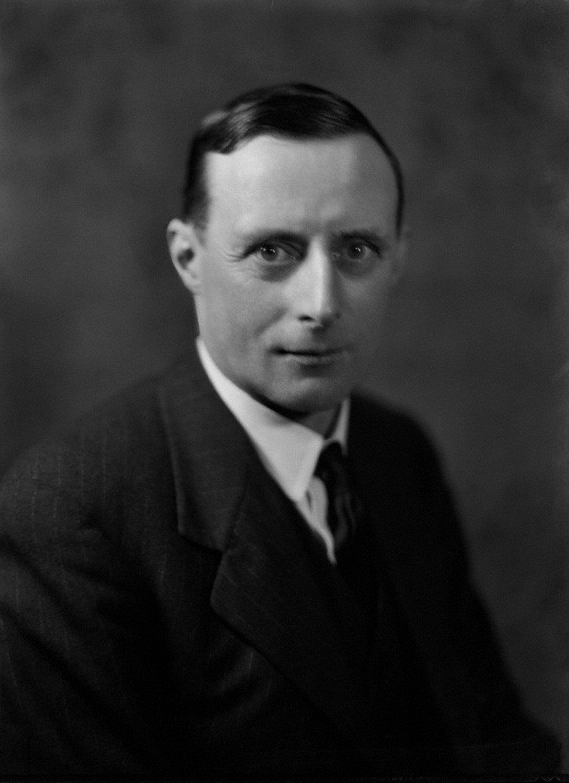 He was elected Unionist Member of Parliament (MP) for East Fife from 1924 until he lost the seat at the 1929 General Election. 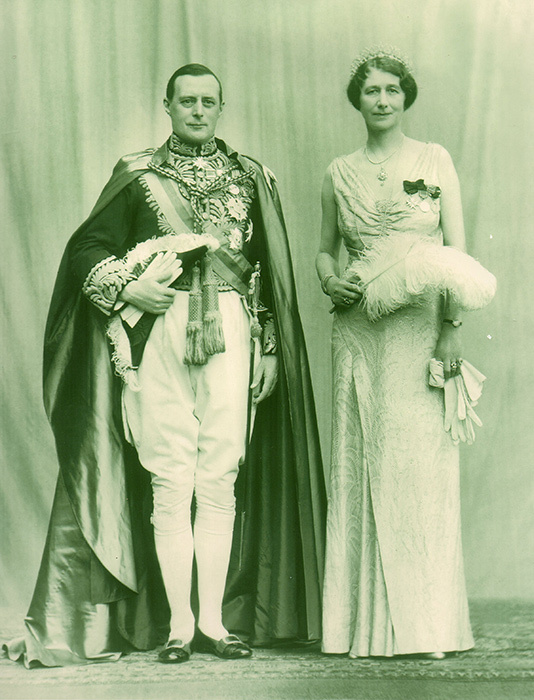 He became MP for Dunbartonshire in 1932 until, in 1936, Edward VIII appointed him as governor of Burma until 1941. My grandfather was also fortunate with the timing of his office, enjoying relative peace despite an upsurge in Burmese nationalism. A year after he left Burma his successor, Sir Reginald Hugh Dorman-Smith, endured the humiliation and horror of the Japanese invasion of Burma. During World War II my grandfather captained a merchant cruiser in convoys. After the war he turned to business until he died in 1958 in Inglisfield, East Lothian, aged 73. He was buried in Cults Kirk in Fife, near the ruins of Crawford Priory where he spent some of his time. His public life is well-recorded and there are archives of his personal and photos of old Burma in the National Library. So what was he like as a person? Cousins who are alive and knew him recall him well when they can be less complimentary of other family members. My godfather as a young boy was scared by his formal manner. Another cousin remembers him as more fun, as a boy using my grandfather as a climbing post. Memories are unreliable of course but from the fragments a picture emerges of a man who was stiff but fair and always gave credit to the men who served with him. At times he may have been easier to respect than like, yet he stayed in touch with his fellow escapees, helping them in later life. He had a practical and inquiring mind judging by his proposals to improve the performance of submarines (the Cochranes have a history of practical invention which sadly was not passed down to me). As a man with some influence he worked to secure pensions and financial arrangements for his fellow sailors and the relatives of dead seamen. His letters from Burma to my grandmother are surprisingly tender. His contemporaries in Burma were less complimentary about him. Colonial memoirs sting with insults directed at the governor. Cochrane, wrote Leslie Glass, was a “crashing bore”. Major Enriquez described him as dour, taciturn and, that old misogynist insult, an old woman. He had his defenders – Major-General Twiss praised his “delightful sense of humour” and determination to tour Burma and understand its peoples. A story was recounted by Enriquez to prove my grandfather’s failings. One day he was at the Rangoon horse races on the great day of the Governor’s Cup when “he turned to an aeroplane in the sky. ‘Ah,’ he murmured to the horrified lady sitting next to him. ‘At last something to look at.’” Clearly, insulting the horses was the final straw in such society. In fact my grandfather may have had a long-simmering feud with horses when his wife decided some of their wedding photos should feature her favourite one. Nonetheless, much but not all of British colonial society in Burma was notorious for its oppression, exploitation, snobbery and imperial racism. Its shortcomings were depicted in George Orwell’s Burmese Days, although some critics at the time argued that Orwell’s portrayal had been unfair. Another insight comes from the account by Pablo Neruda, the Chilean poet who was later to become a friend of my father. During a miserable diplomatic posting to Burma in the early 1920s the young Neruda found the English “monotonous and even ignorant”. He was ostracised for fraternising with locals and an obvious love for Rangoon streetlife, writing and Burmese women. My grandfather seemed to have a genuine love for Burma and its peoples and may well have been at odds with the dark side of the empire (although it should be added that he must have shared some of the beliefs and assumptions common at the time). There might also have been cultural differences where dry Scottish wit does not always work with English sensibilities. Or he may simply have been a crashing bore. 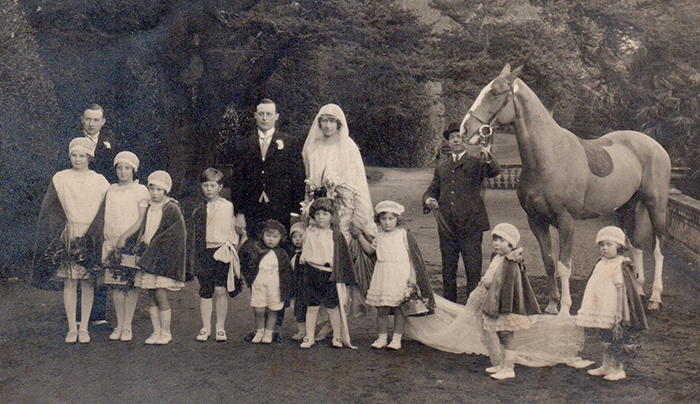 Wedding photo of Archibald and Dorothy Cochrane – with horse! Exploring the history and archives of my grandfather is a journey into vanished worlds, history, war, empire and family. It especially resonates at a time when national identity and empire have become battlegrounds for the culture wars of the age of Brexit. Despite all that we should know about empire, both the good and the bad, a YouGov survey in 2014 discovered that 59% of the British population think the empire and its legacy is something to be proud about. The reaction to empire, and its legacy, is far more complicated than can be summed up by the answers to a survey yet it does reveal an evasion in understanding history, and the purpose of empire. Yet I wonder how my grandfather, who benefited from democratic politics, felt about his role in empire? I also wonder what fear he felt for when they were caught in the nets and the nerve needed to serve in dangerous, early submarine warfare of the First World War. I wonder about the boredom of a prison camp and I wonder about a boy growing up in the horse and cart age of rural Fife, and later in his life seeing an empire rapidly fade and a Japanese city flattened by one nuclear bomb. We think we know fear, chaos, change and identity more than previous generations – we don’t. The enigma of our personal ancestors is such a intriguing subject. Your grandfather sounds like a larger-than-life personality. I’m always impressed how you can set aside the filters of your (our) generation and examine the past without judgement. This is such a rare and, in my opinion, admirable ability. “We think we know fear, chaos, change and identity more than previous generations – we don’t.” So very true, Alex. But few would admit to this. We’re supposed to become more evolved with every successive generation. Many thanks and that’s very kind of you to say that because that’s exactly what I’m trying to achieve. I’m trying to explore the past with an impartial, non-judgmental mind – especially important when it comes to family matters. Loved this reflection on your grandfather. Wish I could see more of his stuff from Burma days. Thanks Maggie – more is on the way! I’ll keep you posted. Good! Waiting for the next installment. An interesting read Alex – especially as I’ve just returned from Chile and encountered remnants of another of your ancestors, Admiral “Lord” Thomas Cochrane, exploits. Interestingly, Pablo Neruda has a rather fine oil portrait of Lord Cochrane hung in prime position overlooking the harbour in his Valparaiso home . Thanks Cris – one day I really should get to Chile and have a wander around the footsteps of the Admiral. Look forward to seeing the slideshow in June! Enjoyed this post, Alex. I like the way you weave together the personal stories, historical events, and make it all relevant to today. I look forward to reading more! JA – thanks for your kind comments! I’m always interested in how people react to history around them so glad that comes across.